1/5th Bn, The Suffolk Regiment, 163rd Brigade, 54th Division, M.E.F. Next of Kin: Son of George Robert Kendle; husband of Lotta Kendle, of "Lindfield," Avenue Rd., Malvern. The Sherborne School Roll of Honour records the Robert Kendle was a “Major in the Suffolk Regiment, 5th Bn. (T.); as Honorary Captain in Regulars, volunteered for foreign service; 1915, gazetted to Major, made a district Musketry Instructor, and received Volunteer Decoration; went to Gallipoli in July 1915. Killed in a bayonet charge at Sulva Bay, Gallipoli on 12 August 1915. 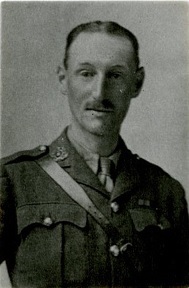 Robert Kendle (or Kendall as he is remembered at Great Malvern Priory), the second-in-command of the Territorial unit the 1/5th Suffolks lost his life in one of the most disastrous, badly conceived and organised actions on the Gallipoli Peninsula. The advance, (made famous by the TV programme All The Kings Men when the men of the Sandringham Company seemingly vanished), involved the 5th Norfolks on the right, the 5th Hants in the centre and the 5th Suffolks on the left. The Suffolks lost an equivalent number of men as the Norfolks but did not have the high profile links with the Royal Family. At 2 pm, on the 10th August the Battalion disembarked at Suvla Bay and the following day they occupied the Reserve Trenches. On the 12th the officers at Battalion Headquarters suspected an advance was in the offing, but only received orders when the Brigade Major stormed into the HQ demanding to know, in heated terms, why the Suffolks were not advancing. Apparently a single memo had been circulated to the units of the line, but had never reached the Suffolks. The order to advance was given, but no objective was given, no relevant maps had been issued and there was to be no unit to the Suffolks left flank, leaving them ‘in the air’: i.e. open to fire from that quarter in addition to that from their front. From the outset the advance problematic, within half an hour heavy rifle fire and shrapnel took its toll on the advancing troops. As they advanced, the support companies veered off to the right, and left the forward companies exposed to fire from the rear as well as from the left flank and the front. In addition, the forward companies had to move through fields of uncut corn to which the Turks set fire. One witness, H M Lawrence presumed it was at this juncture that the Commanding Officer (Lt-Col W M Armes TD) and the Second-in-Command (Major Kendall) were killed. By dusk the remnants of the Battalion made touch with units of the 10th Division and halted, but 11 officers and around 180 other ranks had been killed, wounded or were missing, and due to the lack of clean drinking water, about the same number were sick with dysentery. As a member of the 5th Suffolks, a territorial unit, it is unlikely that Robert Kendle lived in Malvern before the war, but the Commonwealth War Graves Commission recorded his next of kin as his wife who resided in Avenue Road, Great Malvern. He is also commemorated on the Romsey War Memorial. War Diary of the 1/5th Suffolk Regiment: Public Record Office WO 95/?